Life is really a trail that runs zigzag across the wilderness of time. It often crosses into the lives of people who become special in our hearts. But no matter how much we try to hold on to the special moments we create and cherish together, we have to drop them off at one point of time as we continue our journey. This is a painful reality we often have to go through in our life. It’s true that time does not wait for us. It constantly keeps us on the move. As a result, it’s part of our life to meet and depart with people whom we love and appreciate. There is no time for us to stay forever with people who are special to us. People say that life is like a bicycle. We have to keep it moving in order to balance it. So there is no way we can stop it when we have met someone we love. 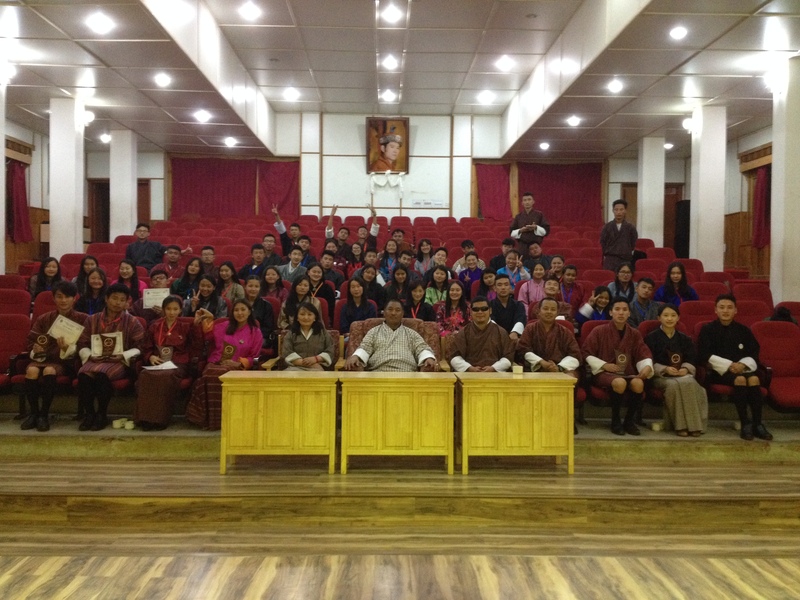 The emotions were already running high as the members of Harmony Youth Volunteers (HYV) started gathering inside DYS Auditorium on Saturday evening, 8th July 2017 to bid farewell to their outgoing friends. The Harmony Youth Volunteers (HYV) is a youth volunteer group attached to Youth Center Division of the Department of Youth and Sports, Ministry of Education and it was instituted on 12th August 2010. The dinner was hosted to celebrate the success and achievements of the group as well as to bid farewell to about 14 outgoing volunteers who are leaving for higher studies. The special bond that they had shared as volunteers at Harmony Youth Center over the past couple of years was clearly visible among the members as they interacted with each other. For the outgoing volunteers, they have reached another major juncture of their life from where they are bound to diverge into different paths, the paths they had not walked before. In a few months’ time, all of them will be in the colleges, creating new memories in the new environment, but the vacuum that has been created between them and other members who are left behind cannot be filled up easily. The event started at around 7 o’clock in the evening with a cultural program. Those volunteers who are going to remain behind performed a beautiful dance and sang a melodious solo song dedicated to their outgoing friends. After the cultural show, we were emotionally moved when the members took turns to walk to the stage to convey their love and wishes for each other. The former president of the group, Kiran Adhikari thanked the outgoing members for their immense support and cooperation during his tenure and apologized for any misunderstanding he might have created during the course of their interaction. One of the outgoing members, Legzin Dema who is the former Member Secretary of the group acknowledged how being a volunteer at Harmony Youth Center shaped her life and that she is grateful for all the opportunities she has got as a volunteer. She has been an active volunteer since she joined the group in 2014. Another outgoing member, Jigdrel Wangmo thanked DYS for giving her a space to volunteer as a result of which she has completely transformed her life. She said she was not as confident and good at public speaking as she is now when she joined as a volunteer in 2014. She acknowledged that had she not joined Harmony Youth Volunteers, she would not have developed all those skills. “As a volunteer, I have been able to understand different youth issues in the country and hence, I know I now have adequate skills to cope with them if I ever face them in my life hereafter” she said with confidence. 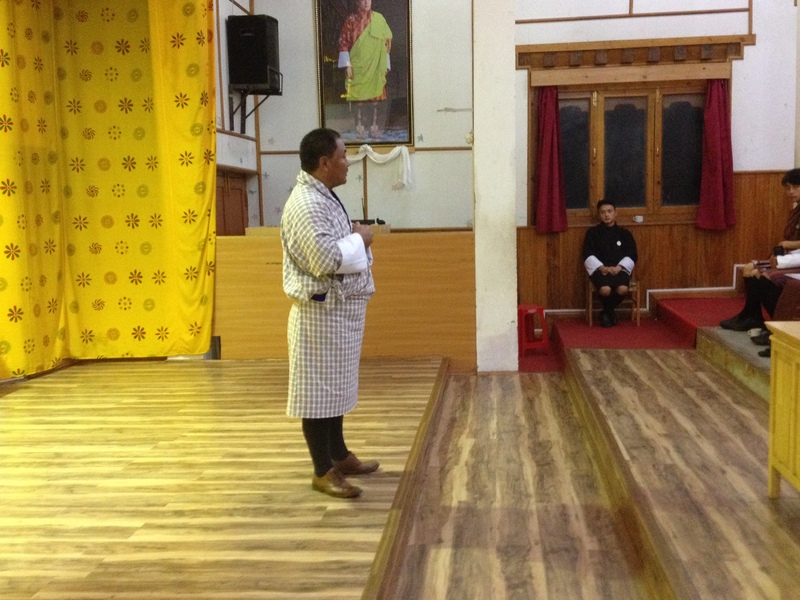 The interaction ended with the closing remarks by the Director General of DYS, Dasho Gholing Tshering. The Director General congratulated the group members for all the initiatives they are taking as volunteers. He also recognized all the hidden talents within each member and urged them to keep their passion alive forever. He wished all the outgoing members a success for all their future endeavors and advised them to take the spirit of volunteerism even to the colleges they go to. “Now that you have become a good person, you should try to help other friends to become like you” he told the volunteers. The Director General was so impressed by the works done by the members as a group and the successes they have achieved together. “Leaving for colleges does not mean that you should completely forget Harmony Youth Volunteers. You should come back during the vacations to volunteer and keep the Department updated on your whereabouts and your college life” he said. Finally, the Chief Program Officer of Youth Center Division, Ms. Rinzin Wangmo also conveyed similar messages and wished them a safe journey to their colleges. The outgoing members were given a small souvenir as a gesture of appreciation for their contributions as volunteers at Harmony Youth Center so far. The program came to a close with a simple dinner in the office cafeteria. As a host organization, it was quite sad for us to let go some of the most seasoned members of our volunteer group. But the greatest consolation we had was that they are heading to a better future. Looking at the transformation they have gone through, it gives us a special reason to breathe a sigh of relief that all the opportunities and platforms we have given them during the course of their volunteering service have not gone in vain. We all know that when they had first come, they had come just as caterpillars and now it gives us immense joy to see them fly away as butterflies. We wish to see each and every member of our volunteer group attached to all the Youth Centers in the country to become a paragon like them. Once again, the entire DYS family would like to wish you the best of luck in your future endeavors. We wish to see you back during your vacations and even after your graduation.